1. Denver is near the mountains, not in them. There are 200 named peaks visible from Denver, including 32 that soar to 13,000 feet (4,000 meters) and above. The mountain panorama visible from Denver is 140 miles (225 km) long. 2. Denver really is exactly one mile high. There is a step on the State Capitol Building that is exactly 5,280 feet (1,609 meters) above sea level. In Denver's rarified air, golf balls go 10 percent farther. So do cocktails. Alcoholic drinks pack more of a wallop than at sea level. The sun feels warmer in the thinner atmosphere, but your coffee is cooler because water boils at 202 degrees (94 degrees Celsius). 3. Denver has one of the most walkable downtowns in the nation. 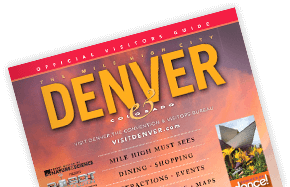 Denver boasts the 10th largest downtown in America and one of the most exciting and walkable. Within a mile radius, downtown Denver has three major sports stadiums, the nation's second-largest performing arts center, three colleges, an assortment of art and history museums, a mint that produces 10 billion coins a year, a river offering whitewater rafting, more than 11,000 hotel rooms, a downtown theme and water park, downtown aquarium and hundreds of chef-driven restaurants. 4. Denver has 300 days of sunshine a year. Located east of a major mountain range, Denver has a mild, dry and sunny climate with more annual hours of sun than San Diego or Miami Beach. In winter, Denver is dryer than Phoenix with an average daily high of 45 degrees (7 degrees Celsius) in February. Golf courses remain open all year and have been played as many as 30 days in January. 5. Denver's history is short but colorful. In 1858, there was not a single person living in the Denver metro area. Thirty years later, Colorado was a state with a population of almost 200,000. It was a Gold Rush that caused this boom, and in a 30-year period, Denver saw some of the wildest events in the Wild, Wild West. This fascinating period is relived in museums, old gold mining villages and hundreds of elegant Victorian buildings. 6. Denver has one of the most unique city park systems in the nation. Denver has more than 200 parks within the city and 20,000 acres of parks in the nearby mountains, including spectacular Red Rocks Park & Amphitheatre. The city has its own buffalo herd and every year plants more than 200,000 flowers in 26 formal flower gardens. Other mountain parks include Echo Lake, at the base of the Mount Evans highway – the highest road in North America – and Buffalo Bill's Grave on top of Lookout Mountain. 7. Denver is a cultural city with the second highest educated population in America. In its Old West days, Denver had a performance of Macbeth before it had a school or hospital. Today, the Denver Performing Arts Complex has nine theaters seating 10,000 people and is second only to New York's Lincoln Center. The seven-county metro area has a self-imposed sales tax for the arts that raises up to $40 million a year, which is distributed to 300 arts organizations and facilities. Denver's live music scene entertains year-round, ranging from intimate venues like the Paramount Theatre to legendary open-air spots like Red Rocks Park & Amphitheatre, where the Beatles, U2 and many more have played. 8. Denver is one of only a few cities to have seven professional sports teams. Denver loves its sports, from basketball to football to soccer to baseball. Denver also has horse racing and a professional rodeo. Denver has 90 golf courses, miles of bike paths and the nation's most unique city park system. Visitors can explore the city using B-cycle, Denver's pioneering bike-sharing program. Pick up a bike at one of 80-plus stations (located near hotels and major attractions), take a ride and return it at any other station – all for a small membership fee. 9. It's easy being "green" in Denver. From global warming and renewable energy to environmental cleanup, Denver is emerging as a model for sustainable cities. The Colorado Convention Center is green through and through, including a rare LEED Gold certification for existing buildings and the Blue Bear Farm that grows more than 5,000 pounds of fresh produce annually! Denver International Airport is dedicated to sustainable practices, including a Community Stewardship philosophy that includes energy and environmental management, green buildings and noise abatement. The Denver Zoo's Toyota Elephant Passage uses a biomass gasification system, which can turn human trash and animal waste into energy to power the exhibit. Plus, many of Denver’s famous craft breweries are committed to recycling programs and responsible water usage. Whether you're enjoying a night out on the town at one of Larimer Square's independently owned fine dining spots or digging into the offerings from one of the city's many gourmet food halls, you can count on fresh, local ingredients. The city's beer world is booming, too, with new craft breweries opening up every month, along with several distilleries and wineries, too!